Tour the Bod Marley Museum and learn about Bob's most significant achievements as well as the more personal intricate detail of the life of the King of Reggae. 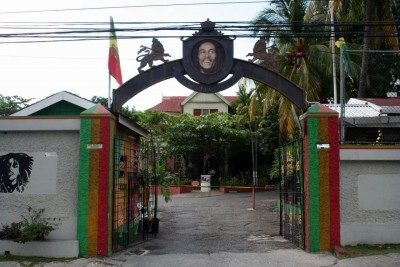 The Museum, formerly Marley's home and Tuff Gong studio, houses an array of memorabilia which include: awards of photographic collections, films and records, his restored Land Rover and the sound of his music chronicling the life of this exceptional musical genius. Following this tour you can visit the on site gift shop which showcases an infinite range of memorabilia items and keepsakes. contact us for group rate for more than 10 persons and for other pick up locations. Do you want to enjoy an unconcerned vacation to Jamaica? Do you want to avoid long wait time at the airport? Do you want to travel at affordable rates while experiencing excellent customer service in comfort and style? Experience the warmth of the island and the great hospitality of the people of Jamaica? The best way is to book or reserve your trip at Sunshine Tours and Transfers. At Sunshine Tours and Transfers we provide airport transfers, a variety of one way and round trips and hotel pick-ups. Our specialization lies thereby at personalized and private transfers to or from your destination. We put the sunshine in your vacation. We guarantee a great Jamaica Vacation experience with the best private ground transportation and tour services. Visit Jamaica, and relax. . .book or reserve at Sunshine Tours and Transfers.